You are currently browsing the category archive for the ‘eating local’s last frontier’ category. A pair of rampaging moose put an exclamation point on the end of our 2011 growing season this morning. Moose absolutely love brassicas, and these two made a meal out of our remaining cabbage, broccoli, Brussels sprouts, and pea plants. 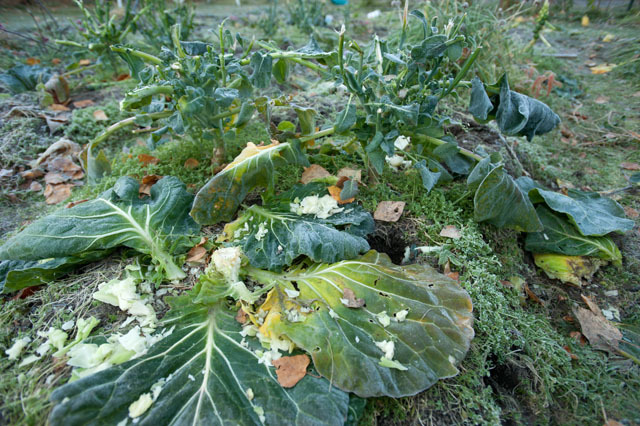 The loss of the sprouts is the hardest to take — they’re very frost tolerant and most of the plants were still in the ground — though we were able to salvage parts of three plants. Our gardening friends in Anchorage suggested we surround the garden with cheap pinwheels to avoid moosepocolypse. Next year. The first frost has yet to put an emphatic end to southcentral Alaska’s growing season but things are definitely winding down. We’ve got a long haul until fresh local produce returns (June!) so preserving some of the summer’s harvest is an absolute necessity. So despite the fabulous weather today I’ll spend at least a few hours inside blanching and freezing broccoli and cauliflower. It’s a simple process, and so very worth it when the days are short and cold. We freeze our broccoli in 1 gallon bags, which is just perfect for making broccoli soup. Cut the crowns into pieces (I chop mine fairly small since they’ll be going into soup), then blanch the broccoli for a minute before dropping it immediately into an ice-water bath. Pat dry the florets, spread them on wax paper-lined cookie sheets and freeze. You can bag up the broccoli once it’s frozen (the two-step process keeps everything from freezing together). I’m sure it would preserve better if you used a vacuum packer but our broccoli doesn’t stay in the freezer long enough to make it worth the extra effort. Romanesco cauliflower from Alaska's Glacier Valley Farm. 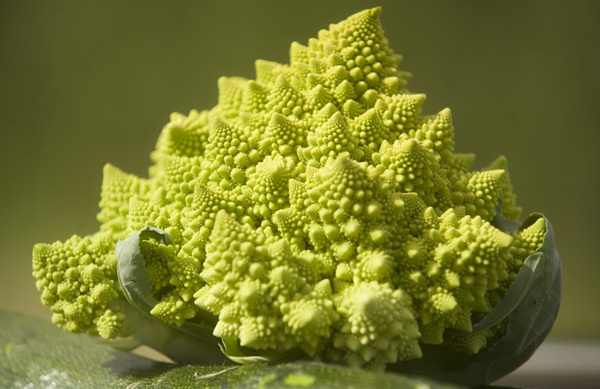 Romanesco cauliflower is one of my very favorite crops — it looks like something from the pages of Dr. Seuss and the spirals expressed by the florets follow the Fibonacci sequence. 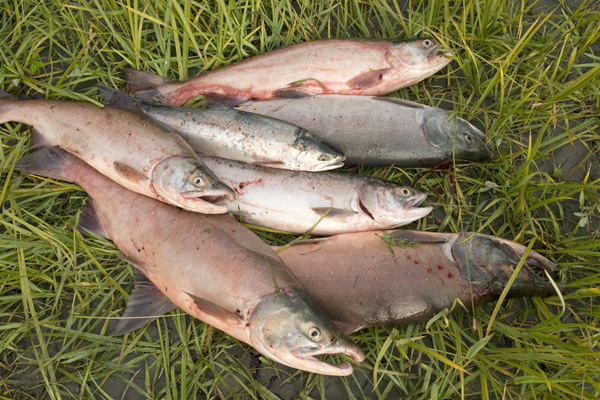 Sockeye salmon from Alaska's Fish Creek. This summer we’ve really been going after the fish — via setnet, dipnet, and rod-and-reel — and as a result we’ve started to exhaust our recipes for fresh salmon. My ran across Kristin Dixon’s recipe for salmon burgers as part of my day job for Alaska Dispatch and rather freely adapted it based on what I had in the kitchen. It was a huge hit with my girls. Cut half the fillet into 1/8″ cubes and puree the other half in a food processor. Combine the salmon and mix it with the beaten egg, Worcestershire sauce, salt and pepper. Form the mixture into patties and cook on the grill or skillet. Kirstin adds a few different ingredients — there are plenty of possibilities — but I wanted to see the reaction without onions first. Make sure you grease your skillet or grill — I’ve found that it’s sometimes a challenge to flip the patties. Planting lettuce seeds at Vanderweele Farm in Palmer, Alaska. Southcentral Alaska still has snow on the ground and though we’re still six weeks away from reliably frost-free nights the local farmers are starting to ramp up their operations. At Vanderweele Farm in Palmer they’ve been planting in their greenhouse for a couple of weeks now and farm manager Roger Vanderweele says they expect to start transplanting to the fields in early May. I find this to be the most stir-crazy time of the year. We’re getting almost 14 hours of light a day — and gaining over 5 minutes every day — yet we can’t expect green-up until the end of May and the local produce scene won’t take off until mid-June. June in Alaska is a tough time for the Eat Local crowd. Long, sunny days and yet we’re not going to see produce at the markets for another two or three weeks. Root vegetables — potatoes, carrots, beets — are still available but supplies are running low and spending the winter in storage takes something out of them. I miss fresh carrots in particular, which made it pretty tough to edit together this video of the Vanderweele Farm carrot harvest from last September. 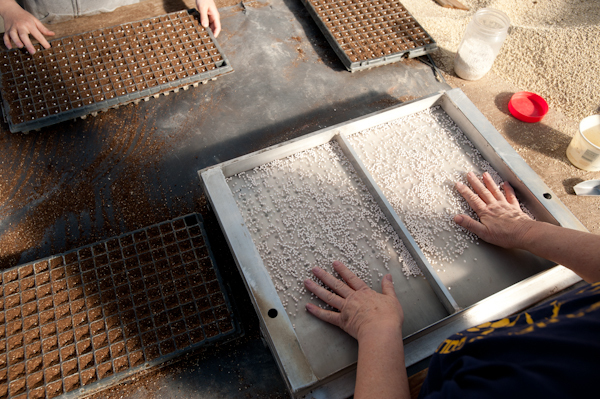 Farmer Ben Vanderweele, right, places trays of onion seeds in his greenhouse on Saturday, March 20. There’s still snow on the ground in Southcentral Alaska but our farms are getting back to the business of growing things. Ben Vanderweele, a longtime Matanuska Valley farmer, started planting onions in his industrial-size greenhouse last week. Cold weather — as in below zero Fahrenheit — delayed him but not for long. Vanderweele said he experiments with different onion varieties, trying to find the sweet spot between cold climate success, flavor and storage. The onions get a head start, but they’ll soon be joined in the greenhouse by trays of lettuce. They won’t be moved outside until sometime in May. During by last couple of visits to the South Anchorage Farmers Market I found myself looking a little more closely at the numbers. I’ve always been willing to pay more for local (chorus: it’s healthier, tastes better, uses less energy, preserves farmland) but the prices weren’t that different, and in some cases were better, than those at my local box store. Onions (yellow): $.75/ea (market) and .99/lb, or about $.50/ea (FM). Corn: $1/ear (end of season price), $.79/ear (FM). I’m curious: do you see similar pricing Outside?